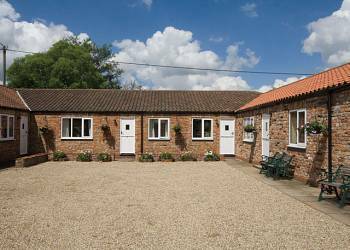 Jorvik Cottage is a two bedroom holiday cottage located close to the City of York in Yorkshire. It is one of eight properties set in 3 acres of landscaped gardens and woodland. This particular cottage is adjacent to the owners' plant nursery and cafe. The master bedroom has a pretty Spanish style 4-poster double bed, as well as a chair bed for a child. The second bedroom is a twin room. The lounge is furnished with comfortable sofas and armchairs and for entertainment there is a TV and a video player. The kitchen is equipped with an oven and microwave. Shared facilities within the grounds include a hot tub which is available from April through to September. There is also a barbeque and a utility area with a washing machine. The owner allows pets (one dog maximum).